Many people will have heard of the renowned American pop artist and filmmaker Andy Warhol but few will be aware of the Baronnies. I am speaking of the Baronnies in the French department of the Hautes-Pyrénées as opposed to an area going by the same name near Mont Ventoux in the Drôme. Andy Warhol is of course no longer with us, but his work lives on, and possibly due to his previous factory* like output, there continues to be a healthy number of exhibitions displaying his work worldwide. I had previously visited a Warhol exhibition in Edinburgh, Scotland, where vibrant works gelled well with the cosmopolitan ambiance of an Edinburgh festival. This was, however, the Baronnies - a lost, forgotten but beautiful rural area of the French Pyrénées. We live in the Haute-Garonne in the south-west of France and had plumped for a short break in a gîte late October, just across the 'border' in the spa-town of Bagnères de Bigorre in the Hautes-Pyrénées. The town was only an hour from our home but the landscape, architecture and feel were so completely different it could have been another country, albeit where the locals still spoke with a similar sounding French southern twang. That's one of the great beauties of France for me; the ability to drive relatively short distances and find yourself in a strange land. Perhaps this is also one reason why so many French don't venture abroad but prefer to holiday 'at home'. We had rented a 2 bedroom gîte for a week (advertised on our site) in the spa-town of Bagnères de Bigorre. The heavens opened just after our arrival and so we needed to find an indoor activity. The beautiful mountain scenery would just have to wait a day or two. 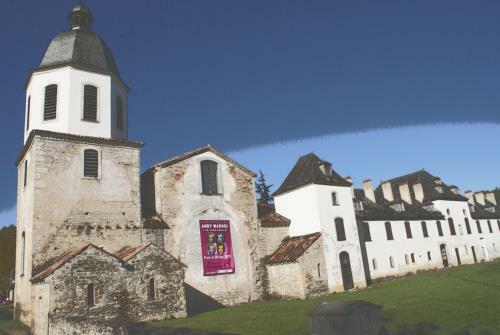 Leafing through the magazine 'Pyrénées', I spotted an article giving details about an Andy Warhol exhibition in an abbey in one of the nearby villages in the Baronnies. Just the job. It would be interesting to see the modern pop art works against the backdrop of a 12th century Cistercian abbey hidden away in the rolling landscape of the Baronnies. The exhibition was entitled "I am from nowhere", perhaps it should have been "I am everywhere". The cosy gîte had a small library of English and French paperbacks. I'm an avid reader of travel books and so was happy to find a well thumbed edition of Tony Hawks 'A Piano in the Pyrénées', a book I hadn't yet read. It appeared appropriate holiday reading material, being a book involving our immediate area. Like many of the spa-towns in the region, Bagnères de Bigorres emanates a somewhat faded grandeur, something the author recognised. One of the most impressive buildings was the casino, a seeming pre-requisite for all spa-towns here. After a couple of days the weather cleared and the days were sunny and dry with a lovely crisp autumnal air. Woodland and mountain walks were on the cards. The first snow of the winter had just fallen and could be seen on the mountains above 700 metres. A lot more snow would no doubt follow in the weeks to come - one of the biggest skiing areas in the French Pyrénées is just up the road at La Mongie. I got my camera out. Perhaps not exactly a Warhol series of prints but rewarding nonetheless. Quite apart from the occasional Andy Warhol exhibition, the area has much to offer visitors all year round. Attractions include the Pic du Midi de Bigorre observatory perched on the 2877 metres summit and reached by a téléphérique. It's even possible to spend a night up there and receive a talk on the night sky. Sitting so high the views are clear of the light pollution below. The mountain roads and cols attract cyclists in surprising numbers - and the mountains themselves, climbers and walkers. Over the col at La Mongie and the road leads you down to Gavarnie and the famous 'Cirque de Gavarnie' classed as a world heritage site by UNESCO. The cirque, in the Parc National des Pyrénéés, is an impressively beautiful natural amphitheatre with Europe's longest waterfall - 'La Grande Cascade'. Autumn proved a good time to visit the area. Visitor numbers were 'manageable' and the woods glowed in golden shades of yellow, green and red. Back in Bagnères de Bigorres itself, thermal baths are an attraction all year round, being enjoyed as a treatment by curists and simply as a treat by many others. Some curists come every year for their sulphurous treatment in the baths. There seems to be a cure for nearly everything. How much of it works is perhaps another question. Some of the larger and busier shops are pharmacies to compliment the thermes. All in all it appears a pretty good situation for a tourist based business and the owners of our gîte certainly seemed busy. One week here was too short for us. Much was left undone, all the more reason to return some time soon.